Cheat Seeking Missiles: The Schwarzeneggerization Of The GOP? A couple days ago, I posed the troubling question, "George W. 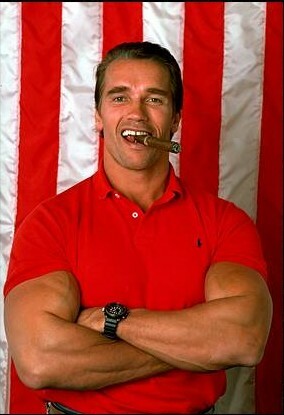 Schwarzenegger?" expressing my concern that Bush's "thumpin'" would result in a move to the left of center, as we've seen in CA's gov since his "thumpin'" in 2005's special election. Arnold Schwarzenegger's 17-point victory alone commands some attention, since it is easily the most impressive score by any Republican in a Democratic-leaning state this year -- and it suggests a future for pro-environment, pro-business, fiscally conservative and socially moderate politics. In trying to excuse their drubbing at the top of the ticket, some California Democrats spin the tale that Mr. Schwarzenegger won only by morphing into one of them. Yet in reality, Phil Angelides, the man he defeated, was the clear favorite of party activists who just this spring brimmed with confidence about their chances of bringing the Terminator to extinction. Mr. Angelides duly followed the left-wing, Bush-bashing script -- seemingly ideal in a state where barely one in three voters supports the president. Campaigning against Iraq and for a classic redistributionist agenda funded with higher taxes, Mr. Angelides won handily among liberal voters in a state where Democrats outnumber Republicans by 43% to 34%. The key to Mr. Schwarzenegger's victory lay not in seducing the left, but through his mastery of the state's rising independent center. According to exit polls, he beat Mr. Angelides by nearly 20 points among self-described moderates and independents. These voters may well be the key to the political future, certainly in California. The Third California is the fast-growing part of the state that extends from the middleands between Sacramento and the Bay Area, down through the Central Valley and into the Inland Empire of San Barnardino and Riverside Counties. The area represents 30% of California's population, and it's growing rapidly, while coastal SoCal has a low growth rate and the Bay Area isn't growing at all. These are the people who voted for Schwarzenegger, and they're largely a moderate bunch, as evidenced by the drubbing the most left-leaning propositions on the recent ballot received, and the defeat of down-ticket conservatives Tom McClintock and Bruce McPherson. Herein may lie the most critical lesson that California can pass on to the rest of the country. Unwilling to let the loonies have clear access to the Treasury, Californians have decided to stymie them with -- literally in this case -- a political strongman. If Ms. Pelosi's crew starts acting in much the same way as their Sacramento counterparts, Americans in the rest of the country could opt for a similar strategy when the next presidential election comes around. As of this reading, holding the White House in 2008 will require a strong man who offers a hopeful path away from the presumable havok begatted by the Pelosi Dems. A particularly ruinous Pelosi agenda could open the door for a true conservative GOP candidate to win, but if America is going the way of California demographically and politically, we may have to accept a Schwarzeneggerized GOP to retain control of the White House.